When it comes to selecting kitchen colour schemes, you could easily spend the next year of your life debating all of the available options as you plan your new kitchen design. 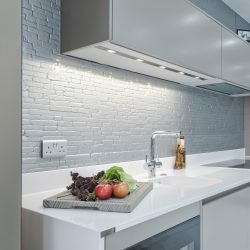 Now more than ever before, you can obtain everything from kitchen appliances to flooring, worktops, cabinetry, back-splashes, lighting, tile and furnishings in virtually any shade or tone imaginable. Faced with such a boggling array of choices, how should you proceed when selecting a colour scheme for your kitchen? First, consider the potential ramifications of a monochrome look. An all white or all black kitchen is fairly easy to kit out and is a popular modern motif. If you combine all black or all white with one accent colour, your kitchen design will likely continue to have a clean, modern aesthetic. If this kind of a sleek, pared down look emphasising a limited palette of colours does not appeal to you, then consider a kitchen at the other end of the spectrum: traditional. What are the best colours for your kitchen? Cool tones, like blues, greens, browns and purples are best for most kitchens. At least for a primary colour. The best thing to do is select a cool tone for your base colour, and add accents of a warm tone. Like blue blended with yellow, or brown and red. Try setting a bright red pitcher like the L. Termain Antique Collection pitcher from Sears on a blue counter to hold your cooking spoons and spatulas. Or a vase of sunflowers on a green table like the Span Mint model from Crate and Barrel. Whites and creams have always been the standby for kitchens. While they look great and are easy to match, they should be avoided if possible, unless you really like them. As with every other room in the house, white is just hard to keep clean. Traditional kitchens often emphasise the use of natural wood in neutral tones like honey oak, warm beige, chestnut and cherry. Country kitchens are one type of traditional kitchen. Other traditional kitchen categories include historic/old world, craftsman style, Victorian and more. In addition to emphasising the use of wood, other natural materials like stone bring in more earth tones for traditional kitchens. These warm tones of brown, sand and bone can be accented with other muted colours like dusty blue, creamy yellow or pale rose. If these traditional colours and styles do not appeal to you, and if you also don’t like the completely modern look described further above, then you are likely a fan of more saturated colours in bright, vivid hues. When selecting kitchen colour schemes that incorporate such intense, saturated tones, pare down your choices to no more than five shades. If you add more colours than that to your kitchen, it will look and feel more like a discordant circus than the peaceful family respite it is designed to be. By a large part, your kitchen colour scheme will depend on your style. A country style kitchen will feature a lot of red and blue, while a vintage style will show more creams and browns. This is not a fast and steady rule, though. What matters more with style and colour is the shade. Take green, for instance. A bright green would work well in a modern kitchen theme, while a mint green brings out the charm of a vintage 60’s era style. Colours have the power to affect our moods. So why not use this to your advantage when planning a kitchen colour scheme? A blue themed kitchen can encourage a pleasant calm view on life. Yellow makes you want to rush, so use it in small doses. Purples also sooth, but maybe a little more than a kitchen calls for. Green is also a relaxing, natural colour. So if you’d like a kitchen that has a relaxing atmosphere, you could do worse things than paint it green, with blue accessories like Lowes Safavieh American Home Blue Oak table. It might not stop your kids from fighting over their homework, but it couldn’t hurt. One way to ensure you don’t go astray and pick too many colours is to select paint and furnishings colours using the guidance of the palettes at your local hardware shop. You can use five different shades of the same colour working your way from very light to very intense (which is sometimes referred to as a “tone on tone” approach), or select one of the schemes suggested by the paint manufacturers. These kitchen colour schemes have been designed by colour and interior design professionals, so you can’t go wrong. Simply select the palette that appeals to you the most, then use that palette to guide your kitchen paint, fabric and wallpaper selections. Carry the palette with you as you shop for kitchen furnishings and linens to make sure you always select the correct shades. Kitchen colour schemes are entirely personal. If none of the suggestions here resonate with you, design your own colour scheme, using inspiration like a favourite vacation photograph or the contents of your wardrobe to help you identify which colours appeal to you the most. If you can only isolate one or two colours you like, take them with you to the hardware store and select a palette that incorporates those colours. Let the design pros guide you in terms of which other colours go well with your favourites. Using this approach, you will customise a kitchen look that is sure to please you.